Founded in 1524 along the bend of the Moscow River, the Novodevichy Convent (New Maiden’s Convent) commemorated the capture of Smolensk from Lithuania. It not only served as a religious institution, but also as a fortress with strong defensive walls and 12 battle towers. We were told it is Moscow’s most beautiful cloister, second only to the Kremlin, so we set out on foot to visit the convent and fortress. Situated on Moscow’s south-western end, Novodevichy Convent is far removed from the hustle and bustle of Moscow’s famously traffic jam-packed streets. In fact, for most of our visit, we practically had the entire complex to ourselves, spotting only a handful of other people wandering the grounds. We easily fuddled through getting our tickets with a kind woman who spoke not a lick of English, but did her best to explain what we should visit inside. It was our first morning in Russia and we had decided to arrive a few days ahead of our G Adventures tour that would take us from Moscow to St. Petersburg along a route called the Golden Ring of Russia. It was visiting beautiful architectural masterpieces like Novodevichy Convent on our own that really made us appreciate Daria, our G Adventures guide. Aside from a few plaques that had blurbs of information in English, everything was in Russian, including the information pamphlet I’d been handed. Inside the complex, there are 4 buildings visitors can enter and a docent will collect a tear-off part of your ticket for each one, so keep them easily accessible. It was particularly gray morning and the clouds above threatened to open up upon us at any second. Apparently if it is raining, the Cathedral of Our Lady of Smolensk closes to visitors. With sprinkles beginning to fall, another kind Russian women quickly pointed us at it and hustled us along. The cathedral is the oldest monument in the complex, dating from 1524–1525. Most of the churches we visited throughout Russia did not allow photography inside, so this is a special treat for us to be able to share with you! We could only marvel at the interior at the time, but we later learned with Daria that the iconostasis is the wall of religious icons and paintings comprised of five tiers. Each of the icons and paintings has a very specific placement and on the first tier, immediately to the right of the gates is always a depiction of the patron saint or feast day to which the church is dedicated. According to a legend, Napoleon had ordered the cathedral to be blow up, but a brave nun extinguished the fuse just in time and saved the cathedral from sure destruction. I don’t know how much truth there is to the legend, but I’m glad for that brave nun. The columns and walls are all covered in frescoes and stretch high above to the five onion domes. I sat on a wooden bench for a while just taking it all in. The red-and-white Church of the Assumption stands to the right of the Cathedral. Here, we again sat on a wooden bench and observed as Russian worshiped. 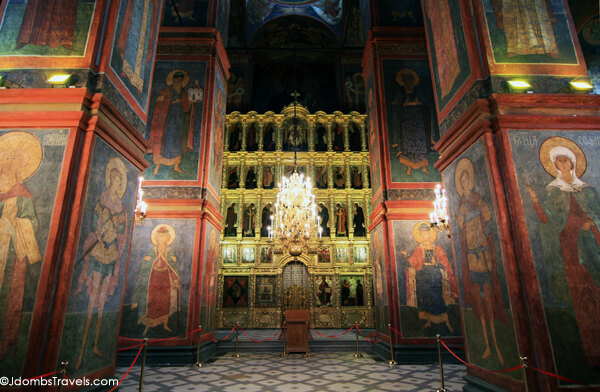 The vaulted windows were each interspersed with individual iconostasis. Admittedly, I don’t know anything about Russian Orthodox, so we just watched as the prayer goers said a prayer to each iconostasis. There didn’t seem to be a specific order; some started from the left, others from the right. Two other buildings houses various exhibits like rare and ancient Russian paintings, woodwork and ceramics, fabrics and embroidery, and a large collection of illuminated and illustrated books decorated with gold, silver, and jewels. Also surrounding the cathedral is the Necropolis of the Convent, where the women of the tsarist and ruling families were buried. 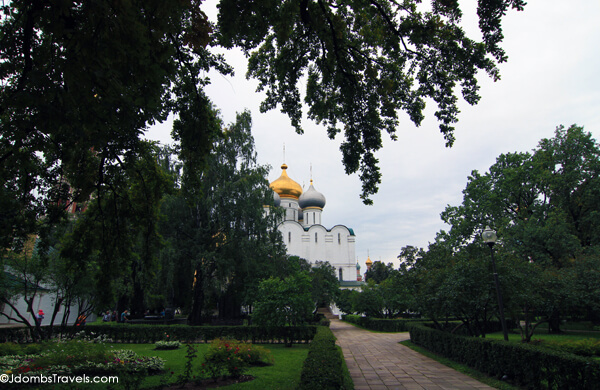 If you know a bit of Russian, you can wander around and see which famous Russian women of nobility are buried here. 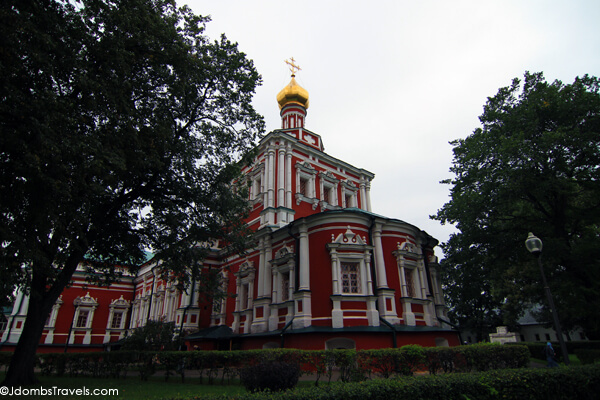 The convent was actually closed after the socialist revolution of 1917, though it re-opened as a state museum in 1926. It resumed its original function as a convent in 1994 and services have been held on saints’ days in the Cathedral of Our Lady of Smolensk since 1995. 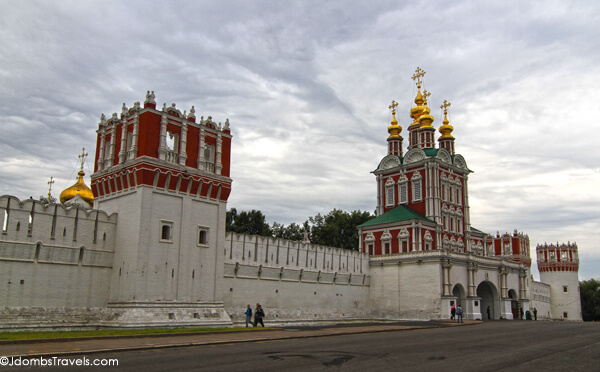 Novodevichy Convent in open to visitors from 10am – 5:20pm Wednesday – Sunday. The ticket office closes 1 hour before closing. Note that it is closed Tuesdays and for maintenance on the first Monday of each month. Tickets are 150 rubles (approximately $5 US) and 130 rubles for a ticket to photograph. Great coverage of such a beautiful place, Jennifer. Looking forward to your other posts from Russia! Thank you! It’s kind of unbelievable how little exists online about many of the places we visited. Russia has tourist infrastructure, but mainly for other Russians that travel within the country. Everything looks so elaborate and well maintained by the local communities, gorgeous – it’s a beautiful structure! Thankfully the complex survived wars and then was placed under state protection. I never cease to be amazed by what I see when traveling to countries that have such a rich historical past. Agree, Patti! Russia was so surprising in so many different ways. Thank goodness for that brave nun – and that Russia’s brand of Communism didn’t call for the destruction of the past (like in China.) I bet they are very thankful to have their beautiful historic structures still in tact. I wonder how much of the population has returned to religion since the fall of the Soviet Union. Everyone we met was very religious and many people go to church. So I think quite a lot have returned to religion. Thanks, Cheryl! The architecture is just so different there! Looks gorgeous! It’ll probably be a few years before we make it to Russia, but it sounds like such a fascinating place, so different from anywhere else. Also, I *hate* when places charge you extra to take pictures! Just seems so excessive. They really could just roll the price of the photo ticket into the regular ticket. No one would know and people would be happy to pay and go about taking their photos. It was cheap, we didn’t mind. But this seems to be a common practice in Russia for places that allow photos inside. It survived a lot, I would think that besides Napoleon wanting to blow it up, it must have been dicey during the revolution as well. Nice to see that the tour takes you to some off the beaten path destinations. So often, you find yourself going to all the tourist traps when on a group tour, good to see that G is thinking outside the box. We haven’t been to Moscow yet, but will add this to our ever growing list. We really liked the balance of free time vs pre-arranged group tours G Adventures had. We had quite a bit of flexibility to add things that interested us. We’re not normally group tour types, but it did have it’s advantages for Russia. Mainly we liked that the G CEO could give us info about what we were seeing since all the signs were in Russian. We visited this monastery on our own during free time. It was definitely off-the-beaten tourist path in Moscow, mainly because it is a little harder to reach than other sights.